Rolf Gardiner, front right, with folk dancers in Dorchester 1939. Herbert von Karajan, Wilhelm Furtwängler and Elisabeth Schwarzkopf are some of the musicians known to have links with fascism, and classical music's various dalliances with the Nazis are well documented. But folk music is considered to be a left-wing artform and little is known about its connections with the political right. November 26th 2011 is the fortieth anniversary of the death of Rolf Gardiner, who in addition to being a leading English folk music and rural revivalist and father of conductor John Eliot Gardiner, was also a right-wing activist. Here is his story. After leaving St John's College Cambridge in 1924, where he studied modern languages and performed calisthenics naked on the banks of the Cam, Rolf Gardiner started performing with his Travelling Morrice dance troupe. Although Gardiner was one of the pioneers in the folk music revival, his political and occultist agendas were not shared by more traditional revivalists such as Cecil Sharp. 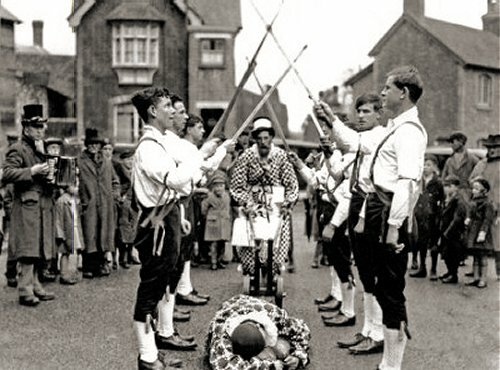 Gardiner believed morris dancing was a form of earth magic that connects the universe to the soil through the conducting rod of the human body and as female participation would disrupt these elemental energies he advocated that dancing should be restricted to virile males. In the late 1920s Gardiner, who had typically blond Aryan colouring, became involved in international youth projects. His agenda was to promote understanding between Britain and Germany by organising work camps and leading folk dancing and lecture tours in England, Germany and the Baltic States. 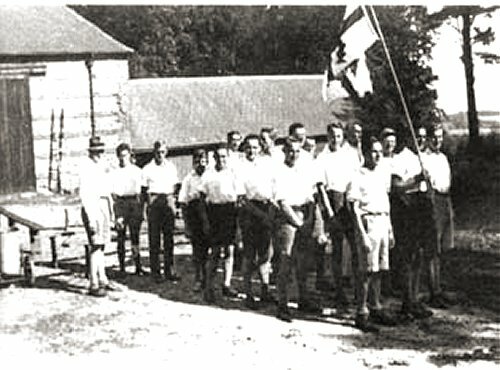 Gardiner was involved with several of the diverse Scouting movements that originated in the 1920s and was 'gleemaster' of the Kibbo Kift. This was a youth organisation that mixed outdoor survival skills with neo-pagan spirituality and which numbered Nobel laureate Rabindranath Tagore, H. G. Wells and eugenics pioneer Julian Huxley on its advisory committee. In the 1930s Gardiner organised Whitsun choral festivals at his Springhead Estate in Dorset and he set up the Gore Kinship group on his estate modelled on German youth groups - see the photo below. Later Rolf Gardiner joined the English Mistery and English Array organisations. The former was a political and esoteric group that has been described as "reactionary ultra-royalist and anti-democratic". After a split in the English Mistery in 1936 the English Array was formed with a more overtly pro-Nazi agenda which aligned it with Oswald Moseley's British Union of Fascists. Gardiner was an admirer of the Jugendbewegung (German Youth Movement) and later a supporter of Nazi pro-ruralist policies. From the late 1920s he publicly advocated policies to counter what he saw as the "impoverishment" of the national racial stock, and from 1933 published anti-Semitic views, initially in German. When the full extent of the Nazi programme became known Gardiner modified his idiosyncratic interpretations of folk ritual After the Battle of Britain in 1940 he made a broadcast on BBC radio in which which he distanced himself from Nazism and justified his support for prominent German ruralist whose policies he claimed had been misappropriated by the Nazis. In 1941 Gardiner became a founder member of Kinship in Husbandry, a precursor to the influential Soil Association, which today has HRH the Prince of Wales as its royal patron. However, after World War II Gardiner maintained contact with Richard Darré who he had visited in Germany before the war. Bearing the rank of SS-Obergruppenführer Darré served as Reich Minister of Food and Agriculture from 1933 to 1942. He was tried and found guilty at the Nuremberg Trials but was released in 1950 after serving part of his sentence and died three years later. Darré was the Nazi genetics expert who made the infamous "all men remaining in Britain as slaves will be sterilised" speech in 1940. Rolf Gardiner died in 1971 and is remembered today mainly for his pioneering approach to organic farming which lives on in the work of the Soil Association. His reputation has been variously summarised as "an enigmatic and complex English paternalist and patriot whose intellectual and practical influence on later generations of organicists has been profound" and "the English neo-Nazi". His work with music and dance is almost forgotten but it did surface in the 2008 book Youth Culture in Modern Britain. In it Cambridge University academic David Fowler argues that the Beatles "were young capitalists who, far from developing a youth culture, were exploiting youth culture by promoting fan worship, mindless screaming and nothing more than a passive teenage consumer" whereas "people like Rolf Gardiner were true cultural subversives - pop stars before pop stars even existed." So folk music pioneer, organic visionary, neo-Nazi or culturally subversive pop star? - you pays your money and you take your chance. But one thing is certain, Rolf Gardiner was complex. A meeting of the Gore Kinship at the Gardiner family estate in Dorset..
* It should be noted that the German lawyer Manfred Pfister said the following in an interview: "John Eliot Gardiner may farm organically on the same acres and his ideas of polyphony and rhythm may in some way still be connected to the musical outlook of his father, but he long ago took his distance from the dodgy organicism of his father's political vision". * John Eliot Gardiner's great-uncle was the composer Henry Balfour Gardiner who retired from music to manage his farm in Dorset. * Cambridge University Library's Department of Manuscripts and University Archives hold Rolf Gardiner's papers and the biography on the University's website is notable for its omissions. * Another overgrown path uncovered links between Belgian chanteur Jacques Brel and a notorious French war criminal. Uh, wow. Thanks for the research. In Gardner's defence I don't think him or any of the other followers (several of whom were socialists) could foresee in the 1920s the horrible journey that national socialism was to take in the 1930s. Gardiner would certainly have hated the military industrial machinery that led to formidable military efficiency that caught the western nations off guard in 1939. In hindsight some of his choices weem at best naiive and at worst a sinister subscription to racial superiority. I prefer to think of him as an idealist living in a kind of rural idyll where his ideas seemed to have no downside. I like to think that when he realised the rural revival dream was in danger of subscribing to a nazi nightmware he would have realised and broken off those links. He was in my opinion a fool but not a monster.